A short ½ hour subway ride from mid-town Manhattan takes you to a peaceful yet trendy Brooklyn neighborhood of 2 and 3 story buildings that looks like small-town USA and has street names that read like a Monopoly Board. There are several ways to get there. 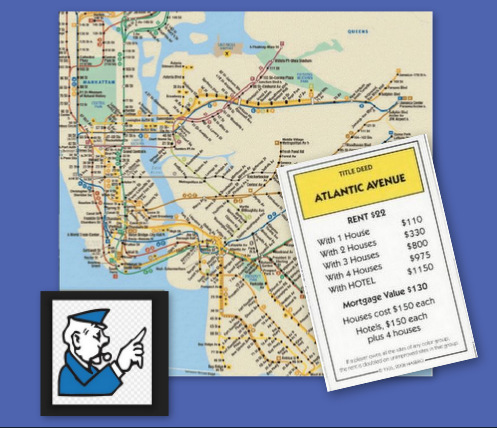 I took the F Line from the 47–50th Sts–Rockefeller Center to the Bergen Street station in Brooklyn, and then walked up Smith Street past Dean and Pacific Streets, to Atlantic Avenue. From 50 yards away it was easy enough to spot the Atelier Cologne boutique’s French blue façade, which within the period of a few short years has become a niche fragrance icon of worldwide resonance. Essentially, with ‘Orange Sanguine’, Atelier Cologne gave birth to a new olfactive family, “Cologne Absolue”, which blends traditional cologne ingredients with high concentrations of essential oils to create fragrances with the feel of cologne and the lasting power of perfume. Clearly this young company was going somewhere – FAST. Now almost two years later while on a February trip to New York, I was curious to visit the recently opened Atlantic Avenue Atelier Cologne boutique, the second flagship boutique in New York, after the original shop on Elizabeth Street. The only time I had to do this was one late afternoon in a snowstorm. Gerard Camme greeted me at the boutique where he and his lovely daughter, Felicia, were helping clients while busily filling Valentine’s Day orders. Before introducing me to the newest fragrances, Gerard reminded me of Atelier Cologne’s fast-paced growth. At the time of the 2012 Fifi win, Atelier Cologne’s “Collection Original” included ‘Grand Néroli’, ‘Bois Blond’, ‘Trèfle Pur’, and Oolang Infini’ in addition to ‘Orange Sanguine’. Soon afterwards, Atelier Cologne brought out another fragrance collection, the ‘Collection Matières Absolues’ which interprets familiar notes like vanilla, amber, rose, vetiver, and patchouli to achieve more intense fragrances revealing new and unexpected personalities. I already told you about my stirring run-in with the ‘Vetiver Fatal’ of this ‘Collection Matières Absolues’ in my January post about vetiver fragrances. Well, this afternoon Gerard introduced me to ‘Rose Anonyme’ for the first time, and I immediately recognized her as a cunning accomplice to ‘Vetiver Fatal’ with her Turkish rose notes, both fresh and earthy. This ‘Rose Anonyme’, as she likes to call herself, could easily turn a man’s or a woman’s head! But there’s more. Just in time for spring 2014, Atelier Cologne is moving full circle back to the ‘Collection Original’ concept of light and fresh citrus fragrances. ‘Cédrat Enirvrant’ (another Ralf Schweiger creation) will be launched in March. On this chilly afternoon in Brooklyn I left Atelier Cologne wearing ‘Rose Anonyme’, braced for the adventures of a wintery evening. At the same time, I was imagining the pleasure of waking up on a spring morning (sometime very soon) and starting off the day with ‘Cédrat Enirvrant’. Today, as I think back on that evening I can’t help but wonder: Did I really hear those birds singing in the snow? Twisted Lily, a new multi-brand niche fragrance boutique, is located just across the street from Atelier Cologne. In fact, it was Gerard Camme who kindly pointed it out to me as I was leaving his shop. Thank goodness he did, or I would have missed it. The minute I walked in the door of Twisted Lily I felt at home. For one thing, although it was late in the day and I arrived unannounced, Twisted Lily co-founder Eric Weiser gave me a warm welcome and an impromptu tour of the shop. I also felt at home because I found myself surrounded by 20 or so of my favorite high quality French and European artistic niche brands: Amouage, Francis Kurkdjian, Penthalligans, Serge Lutens, Patricia de Nicolai, Grossmith, Etat Libre d’Orange, Carner Barcelona (whose fragrance, “Tardes” is currently a Twisted Lily best seller), Xerjoff, L’Artisan Parfumeur, Tauer Parfums….Oh my gosh it’s amazing the treasures that are there. And, can’t forget to mention Jardins D’Ecrivains whose fragrance, “Orlando” is another current Twisted Lily best seller. But what makes this boutique so unusual and gives it that wonderfully American twist is the lively mix of international niche fragrance greats alongside a healthy number of American niche brands. Of the American niche brands at Twisted Lily, there are many I already knew such as, Arquiste, D.S. & Durga, CB I Hate Perfume, The Vagabond Prince, Providence Perfume Co., Memoire Liquide, and Joya. And there are others I’d never heard of at all before my visit. Local Brooklyn brands, such as, Brooklyn Grooming, and Atelier de Geste, founded by a Brooklyn choreographer who after studies in France, returned to create fragrances inspired by dance and movement. Josh Lobe, perfumer and owner of Slumberhouse, and Josh Meyer, of Imaginary Authors, both out of Portland, Oregon. Slumberhouse currently has two Twisted Lily best sellers: “Norne”, with Canadian and Scandinavian forest absolutes, and “Ore”, self-described as, ‘rich, boozy…and inspired by decadent bedrooms and the things that happen in them’. The other ‘Josh’, Josh Myer, is perfumer and owner of a brand called Imaginary Authors. Each fragrance is inspired by a made-up book that includes a made-up story, author, birthday, and death date. For each perfume there is a bookmark with an hilariously melodramatic quote from the ‘book’. From the fragrance “Memories of a Trespasser”, for example, the quote is, ‘Who Needs Love when there is still Cognac in the Glass?’. I laughed as Eric read me the bookmark for the most recent fragrance, “Cape Heartache”: ‘If you are looking for the pieces of a broken heart, you might try rifling through the twigs and needles on the forest floor’. I laughed again when I read that fragrance notes include: Douglas Fir, Pine Resin, Western Hemlock, Old Growth,… and Mountain Fog. I smiled, though, when I sniffed the wonderfully complex fragrance in which I could hear and smell the wind in the high pines of the Pacific Northwest. A true and international melting pot of the American niche fragrance market, Twisted Lily also carries Jaboneria Marianella, a Venezuelan natural soaps brand, and Australian brand, Tommi Sooni whose creator and nose, Steven Broadhurst, is a former Andy Warhol ‘Interview’ magazine photographer. Love Orange Sanguine!!!! Can’t wait to smell the new Cedrat Enivrant! And the two Joshes sound really interesting….Pear & Olive is intriguing but the stories are even better! !